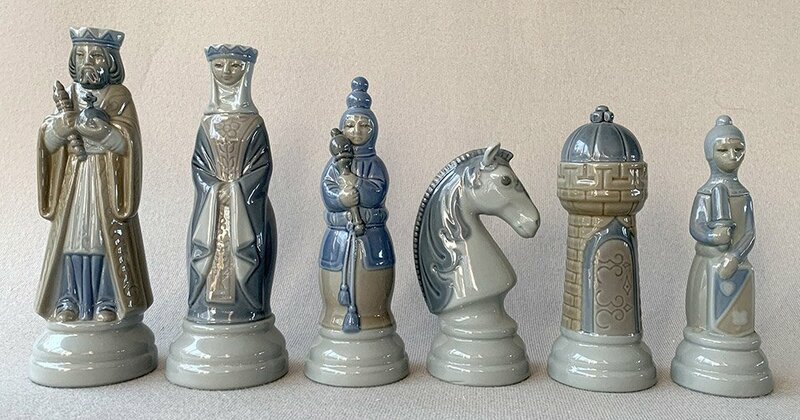 Lladro Porcelain Chessmen, King Richard. Offered here is a set of Lladro Porcelain Chessmen representing King Richard;s Court. 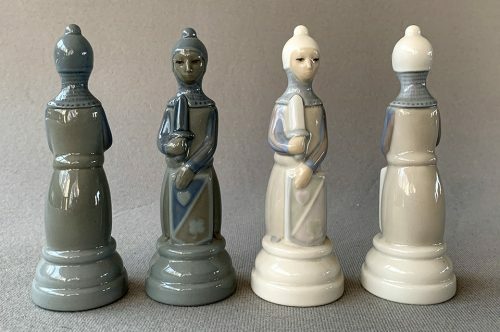 These elegant Medieval Chessmen were produced by the well known and respected Spanish Porcelain Company, Lladró. This polychrome Porcelain chess set features a 7″ King with a 2.4″ diameter base. The underside of each of the chess pieces bears markings from the factory and the sculptor. 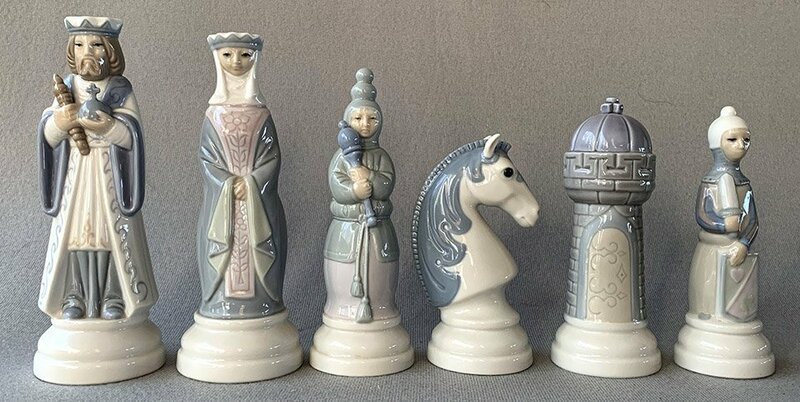 The Lladro Porcelain chessmen were modeled after RIchard the Lionheart. Richard I, who stood a towering 6′-5′ tall, was King of England from 1189 until his death on April 6, 1199, in Châlus, France. He also ruled as Duke of Normandy, Aquitaine and Gascony, Lord of Cyprus, Count of Poitiers, Anjou, Maine, and Nantes, and was overlord of Brittany at various times during this time. The Issue year for this series is prior to 1972. The sculptor is Juan Ignacio Aliena. 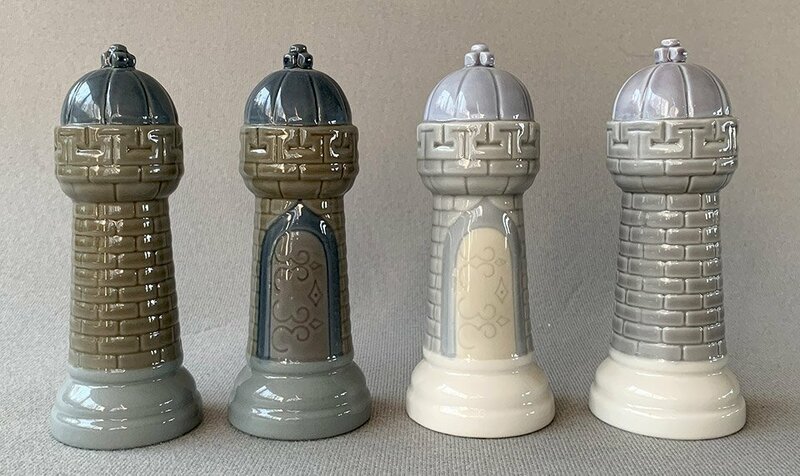 Although created in the twentieth century, these designs are influenced by the style of Europe’s Mannerist period (c. 1520–1600). 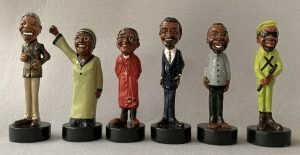 The paintings of El Greco and other Spanish Mannerist artists featured people with characteristics typical of Lladró figurines. These Lladro Porcelain Chessmen require a chessboard of suitable size and elegance. They should not be displayed on a chessboard with square sizes less that 2-3/4″. 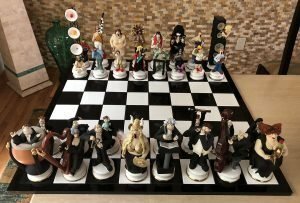 The Ideal square size for these chess pieces seem to be between 3″ and 3-1/4″. 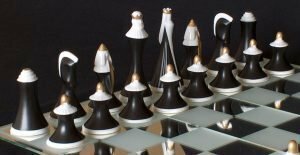 The Lladró chessmen shown are displayed on a chessboard with 3-1/8″ Amboyna and Birdseye Maple squares, which seems to do proper justice to these majestic chess pieces. 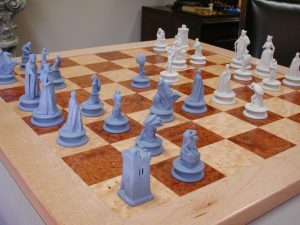 The chessboard shown is not included with these Lladro Porcelain Chessmen, but is available elsewhere on this site. 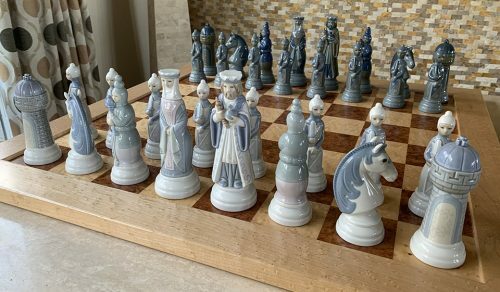 For our extensive selection of new and antique chessboards, follow this link. 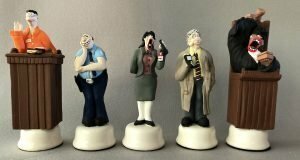 Lladró is a Spanish brand, known for their creation of art porcelain figurines. 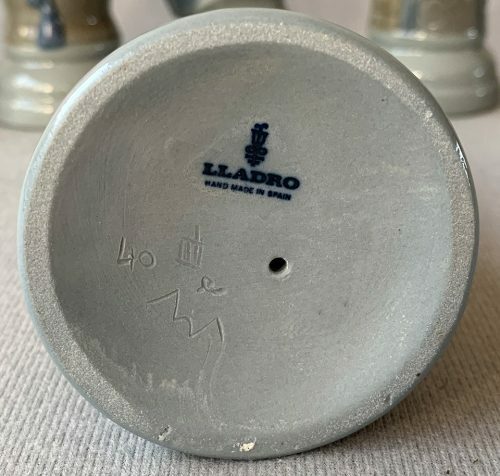 The company has a single factory located in Valencia, a port city that lies on the southeastern coast of Spain. In 1953, at their home in the village of Almàssera, Lladró began to make their first ceramic creations, inspired by the works of the great European manufacturers of Meissen, Sèvres and Capodimonte. It is in this period that the modeling of flowers or the complex treatment of tulle first appeared, examples of virtuoso techniques that can be found today in many of the brand’s creations. At the end of this 1950s, Lladró opened its first store in Valencia, Spain. 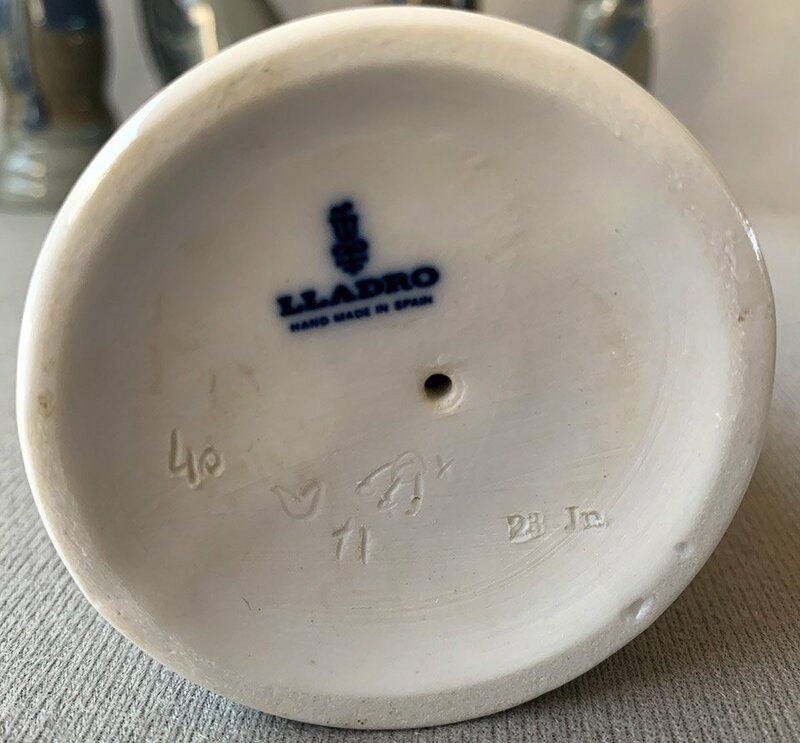 Lladró is the story of the passion for porcelain of three brothers, Juan, José and Vicente Lladró, artists and sculptors who made porcelain into a way of life and built a business empire.